Prachen Glass seems to be one of the lesser known Czech glassworks. 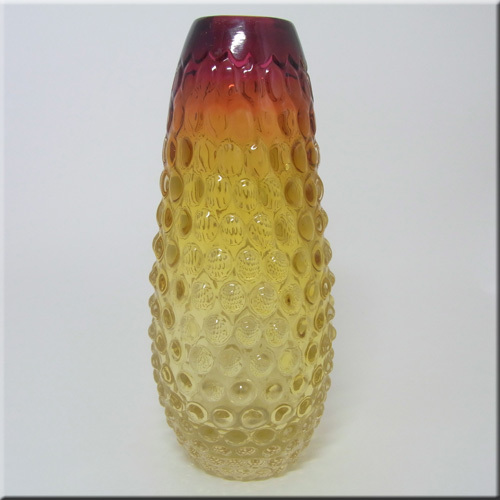 Prachen produced glass during the 1960's/70's and designers included Josef Hospodka (after he left Chribska) and Frantisek Koudelka. 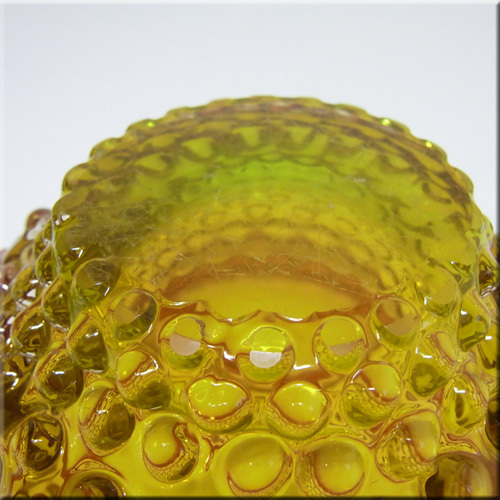 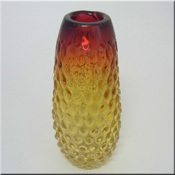 Prachen amber glass bobble textured vase, designed by Frantisek Koudelka, pattern number 87357, 230mm tall. 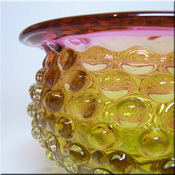 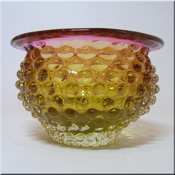 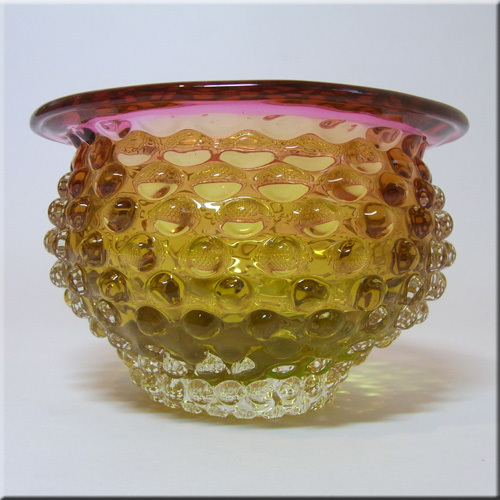 Prachen amber + pink glass bobble textured bowl, designed by Frantisek Koudelka, pattern number 56022, 180mm tall. 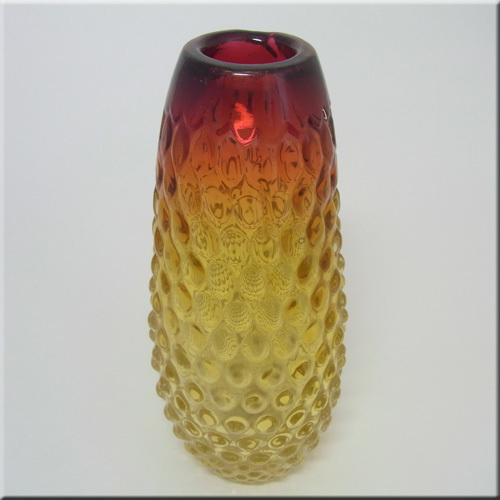 Prachen amber + pink glass bobble textured vase, designed by Frantisek Koudelka, pattern number 87359, 150mm tall. 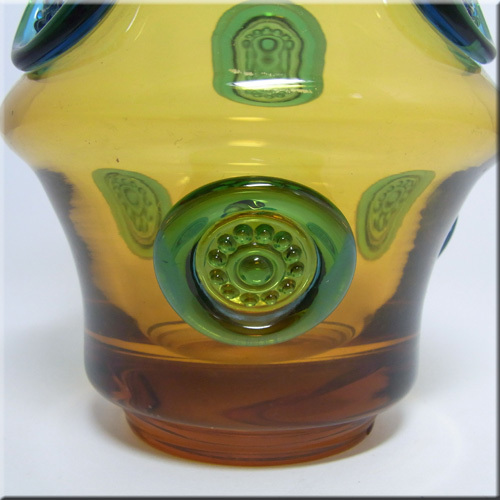 Prachen blue + green glass bobble textured vase, designed by Frantisek Koudelka, pattern number 87359, 100mm tall. 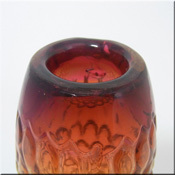 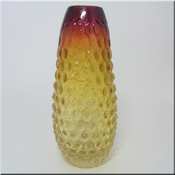 Prachen amber + pink glass bobble textured vase, designed by Frantisek Koudelka, pattern number 87287, 240mm tall. 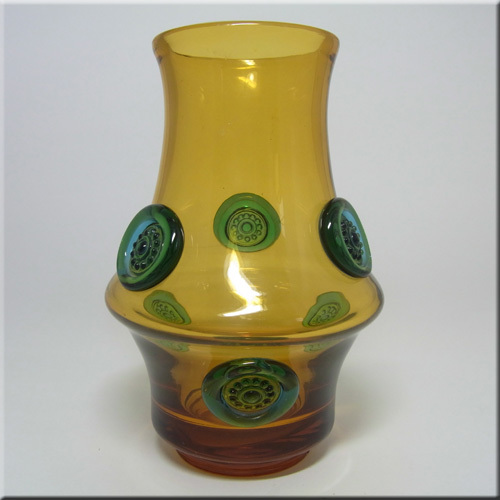 Prachen amber glass flower vase with applied blue glass prunts, designed by Josef Hospodka, 200mm tall. 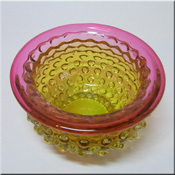 Ref: Hi Sklo Lo Sklo p41. 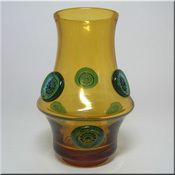 Prachen amber glass flower vase with applied blue glass prunts, designed by Josef Hospodka, 150mm tall. 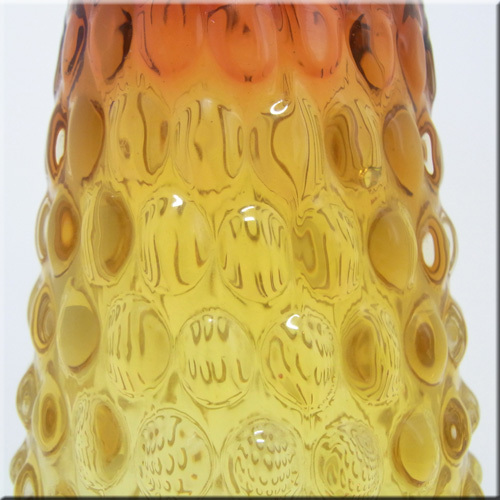 Prachen white + blue glass 'Flora' vase, designed by Frantisek Koudelka, 360mm tall. 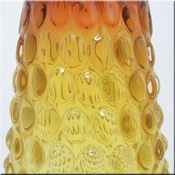 Prachen blue + yellow glass 'Flora' vase, designed by Frantisek Koudelka, 230mm tall. 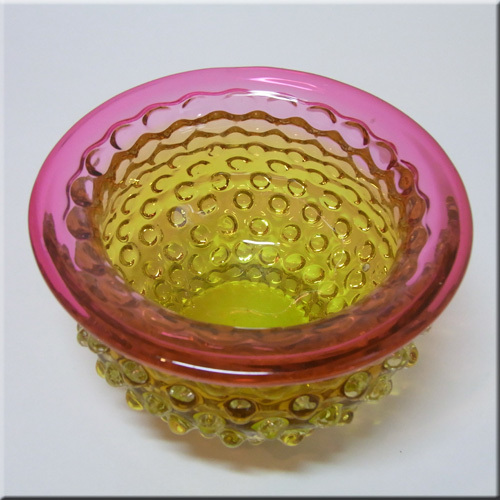 Ref: Hi Sklo Lo Sklo p51. 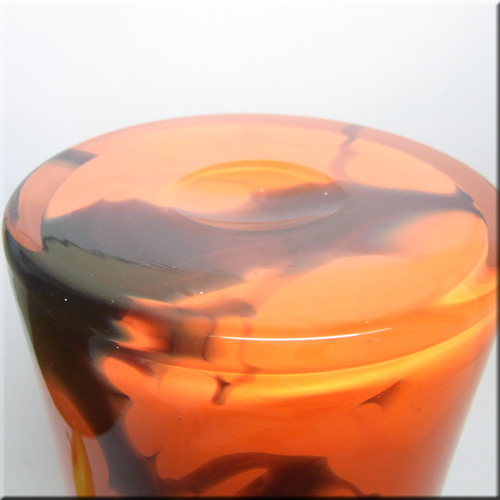 Prachen orange, black + yellow glass 'Flora' vase, designed by Frantisek Koudelka, 290mm tall. 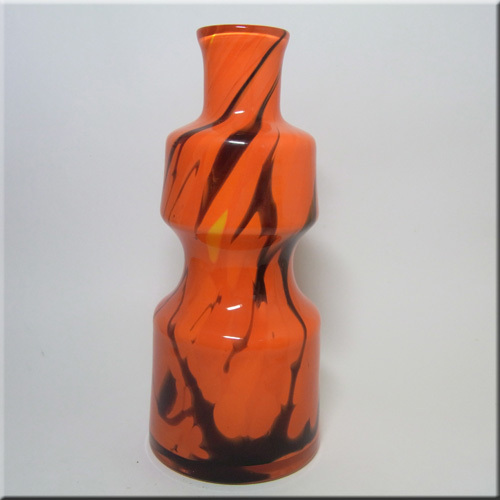 Prachen orange + black glass 'Flora' vase, designed by Frantisek Koudelka, 220mm tall. Prachen orange, black + yellow glass 'Flora' bowl, designed by Frantisek Koudelka, 100mm tall by 210mm diameter. Prachen orange, + black glass 'Flora' vase, designed by Frantisek Koudelka, with Jones Glass import label, 170mm tall.